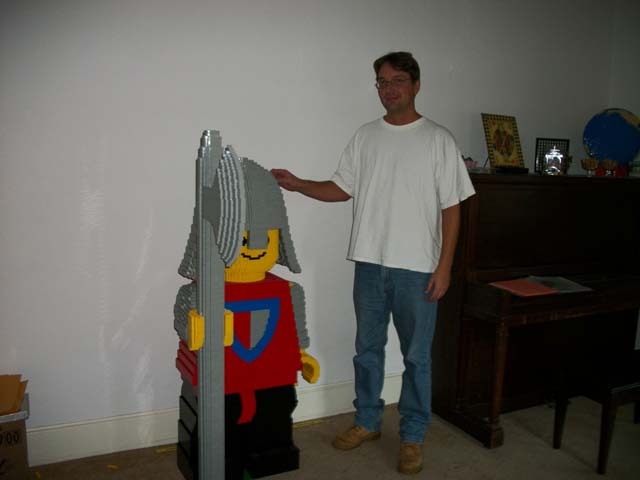 In 1999 I constructed my first LEGO sculpture on commission. 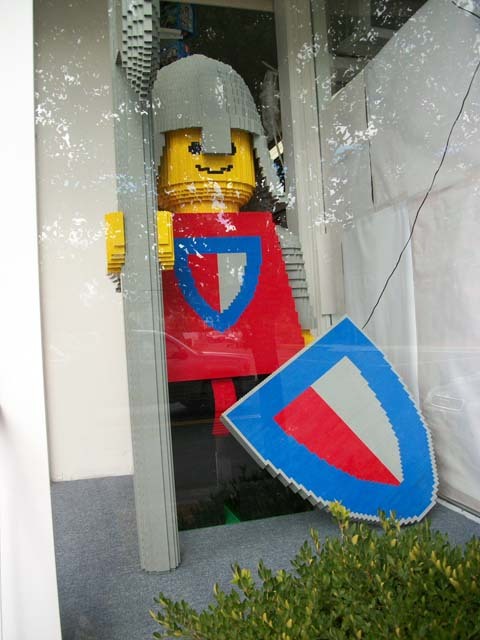 It was for the MIT Media Lab; it was a model of an original LEGO Knight built at 16x scale. Now, almost exactly eleven years later, I've completed another model of the LEGO Knight... but this one is quite a bit bigger. The owner of an independent toy store in Connecticut had seen my previous work, and the knight inspired him to ask if I could build another one. 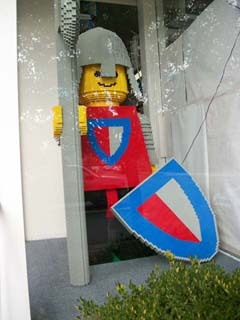 You see, he had this great display window at his store front, and currently it was empty. 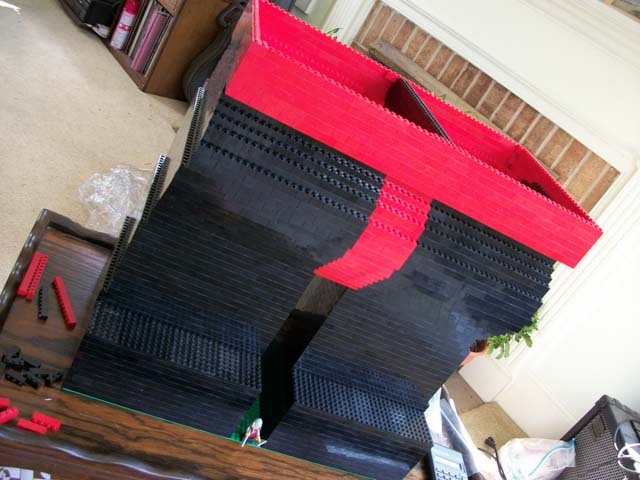 A giant LEGO model would be perfect. Could I build another Knight for him? Oh, and instead of a 16x scale, could I make it 32-times the size of a regular mini-figure? 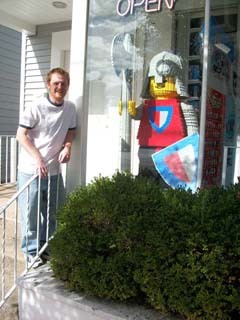 A 32:1 scale of the knight figure would come out to just about 5' tall. Could I do it? Sure. Did I want to do it? Absolutely! 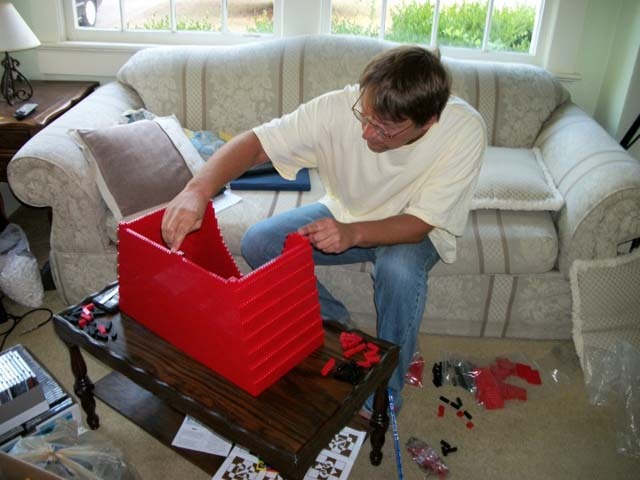 I have a fascination with building enlarged scale models of classic LEGO things... building them out of LEGO bricks. 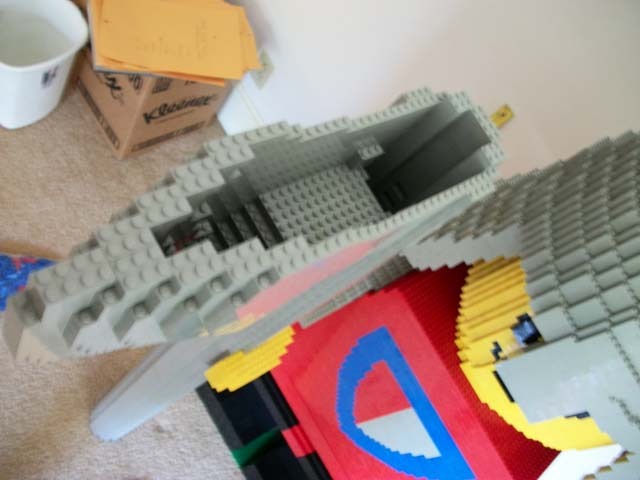 In addition to the Knight16 I built years ago, I have also built a 3x scale model of the classic LL924 Space Cruiser, and experiemnted with enlarged models of the basic brick. I jumped at the chance to do this project and was pleased that the client and I quickly negotiated terms we could agree on. He wanted it by early November (in time for the holiday shopping season), and I knew that would not be a problem. The bigger problem was acquiring the pieces. You see, the mini-figure I was using as the basis for this project had a lot of gray pieces. "Old" gray pieces (LEGO changed their formula for gray bricks a few years earlier). Getting enough old gray was going to take a lot of ordering from BrickLink, and it was not going to be cheap. My contract stated that the client would pay for all of the pieces, but I still wanted to try to keep the costs under control. Well, if there is one thing this build taught me, it's that I've probably been vastly underestimating the bricks required in past sculptures that I've constructed. 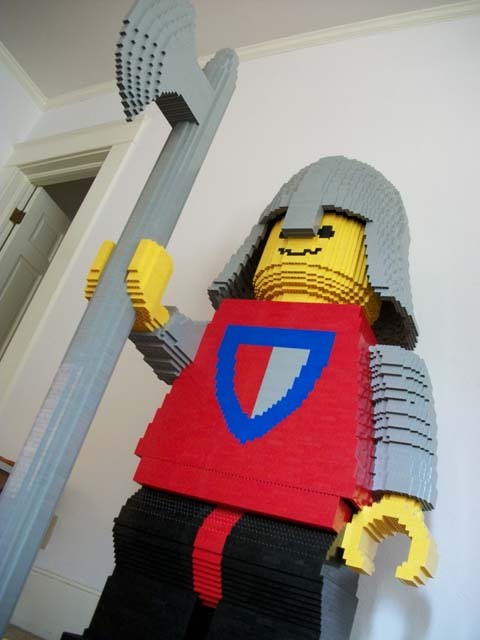 My initial guess for this knight-giant was that it would take about 5,000 pieces. Thirteen orders later, from twelve separate BrickLink stores, over the span of about six weeks (pieces would arrive, I'd use them all up in less than a day of building, and then have to order more...), I had used just under 20,000 bricks. And this was with the model essentially hollow. 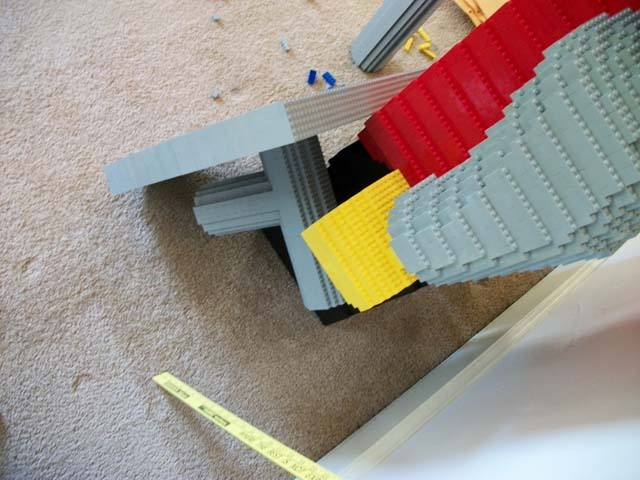 His "skin" was only one brick thick throughout, and there was minimal interior strut-work to keep it sturdy and square. The building was not strenuous at all. The model was fairly symmetric. Only his arms required any free-style sculpture. 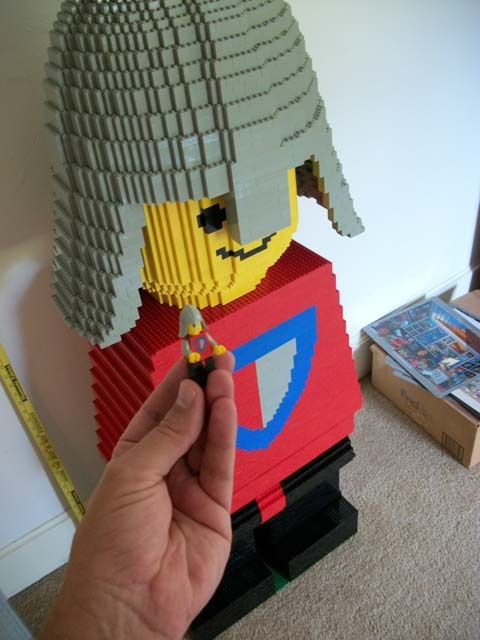 I had a ruler that measured in increments of 1/64", and with horizontal and vertical conversion rates stored in my calculator's memory, it was not to hard to scale the mini-fig into a mega-fig. His feet were 29 studs by 32 studs (with a 6 stud gap between his legs). His head was 40 studs in diameter, and his helmet's bottom flange extended to a 66 stud diameter. The battle-axe was 160 rows tall (with a shaft 12 studs in diameter). And the shield was 6 studs thick. 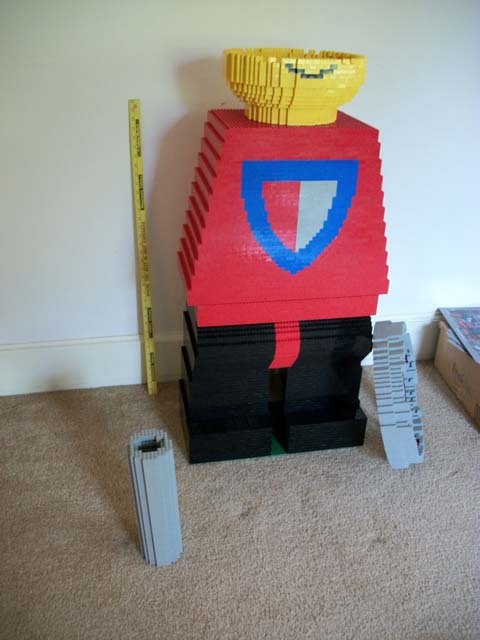 I built it in six modular sections: Legs, Torso, Head, Helmet, Axe, and Shield. And then, when it was all done, I personally drove it all the way to Connecticut for delivery (over 1000 miles each way). It being hollow and unglued, I was not about to trust my packing ability or any courier's shipping ability. 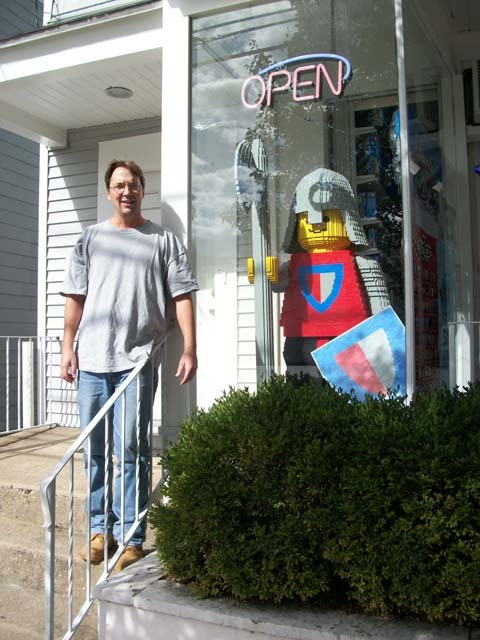 Below are a couple of pictures in Connecticut on 16 October 2010 when it was put on display (I'm in the left picture, and Dan, owner of The White Door store in Norwalk, Connecticut, is in the right one). 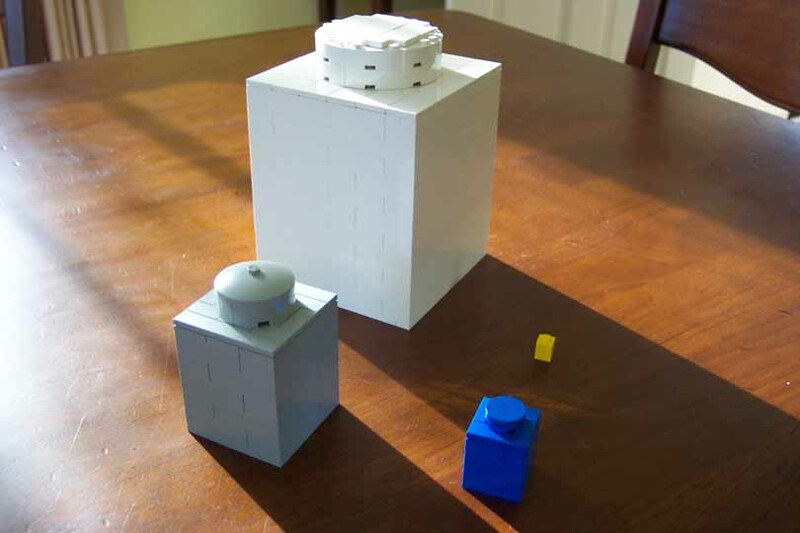 Back to Eric Harshbarger's main LEGO page.